Now you can build your own Stratocaster® Style Replacement Pickguard from the ground up! Choose your own options and styles and we’ll cut it just for you. Whether you have something a bit off the beaten path or want something totally new, you can get what you need here! Check the product images for general reference and options. Click the images to enlarge as needed. Ask any questions prior to purchase as custom orders are non-returnable and non-refundable. *Your choice of right or left handed (lefty) guard style. *Most guards are cut from 3-ply standard pickguard materials. Layers may vary (impacts side edging color only) at our discretion. *Mirror guards are made from an acrylic material designed to protect the mirror finish and will reflect your unique surroundings. *Clear guards have double-sided protective covering without aluminum shielding. *Allow and expect color variation due to photo and monitor settings as well as natural product variance. 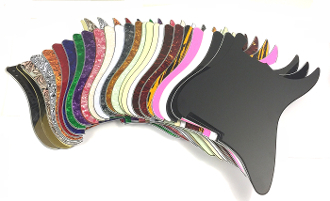 Sample images provided represent the color, pattern, or shading of these pickguards, but will not be an exact match. We do not recommend purchasing if you are looking for a particular outcome or are trying to match an existing color/theme on your guitar. We want you to be completely satisfied with your custom pickguard and thank you for understanding that we cannot guarantee a specific look. *Choose from no mounting screw holes (undrilled, do-it-yourself), conversion 8-hole (8 hole look without needing to drill new holes), vintage 8-hole or standard 11-hole styles. *Pickguard mounting screw holes are counter-sunk. *A reference image is provided to give general (standard) locations for these options. Pay close attention to hole #5. Be sure to select the correct guard mounting style for your guitar or select None (Undrilled) so you can place these where you need them. *Choose from standard or Floyd Rose cut styles. *Floyd Rose Cut pickguards are designed for a Floyd Rose Tremolo rather than a Standard Strat Trem set-up. Guard mounting screw spacing will be adjusted appropriately for this choice as needed. *Choose a Tele or Strat neck pocket cut with or without a truss rod notch (Elite / Pro-Mod style ONLY – not for vintage or other styles). *Choice of bridge, middle & neck position cuts for each slot. *Not all options will work with standard body routing. Body modifications may be required depending on your selections. *Rounded Corner Humbucker Cut Pickguards will not work with covered or active pickups. Be sure to select the “Squared Corner” style of pickup rout for covered, active or other larger pickup use. *If you have something outside normal measurements, be sure to contact us for specialized consideration or a custom quote. *A reference image is provided (image is NOT to scale and is provided as a reference only). *Choice of none (undrilled, do-it yourself), standard or countersunk (SRV style option). --Note that Root Style toggle switch selection is not available with pot hole positions 2, 2.5, or 3. *A reference image is provided to give general locations for all options. *We can send these custom guards without any pot holes (undrilled so you can drill how and where you like) or with pot holes drilled in the position of your choice. Please check out the provided reference image for general hole placement options. Select “YES” if you want a hole drilled in the position indicated and “NO” if you do not want a hole in that position. If you do not want any pot holes drilled, simply select “NO” on every Pot Hole Position Option. --Position #4 may not fit in a standard Strat rout and additional routing may be required with this selection. --Pot holes are compatible with full-size or mini-pots. --Be sure to check your control option selections and compatibility with pot hole selections/placement. --We will drill as you select. Some hole placements will not be compatible with certain routing or may be too closely positioned for standard knob sizes. It is solely your responsibility to determine and select your desired hole placements. Ask questions prior to purchase as needed. *Select this option if you would like a matching trem cover (cut from the same material sheet). This will provide you with the closest possible match to your new guard. Trem covers purchased separately may or may not match. *Your choice of either no mounting holes (undrilled, do-it-yourself), 6 standard or 6 lefty mounting holes. *Select no string slot (uncut, do-it-yourself), standard or lefty string slot placement. *Add on trem covers feature beveled edging. *Select this option to include mounting screws for your new guard. NOTHING ELSE is included. Diagrams/instructions NOT INCLUDED. Additional images may be provided for reference and comparison purposes only. These guards will not fit anything other than specifically noted compatible models. They will not work with non-standard components or systems and may not work with some pickup covers/styles. Guards will not fit “Squier” “Deluxe” “Light” any Artist Series or Reissue, or anything else other than “Fender® Standard” model guitars in the years and configuration noted. Reference images are approximations and not to scale; variability is to be expected. Non-standard selections may require body modifications. Your selections are your own – we will create your guard to order per your specifications. Check measurements before purchase. Depending on your set-up, you may require adjustment. Ask in advance and we are happy to provide fit/compatibility information or make special arrangements in advance. DO NOT PURCHASE if you are unsure of your requirements, needs or ability to make any required adjustments for your newly custom designed guard. THERE ARE NO RETURNS OR ORDER CANCELLATIONS ON CUSTOM ORDERS! Since we process orders as quickly as possible and each guard will be cut just for you, be sure of what you want and ask any questions before completing your purchase. This item is not eligible for return. It is solely your responsibility to know what you need/want and what options will work for your set-up. Allow and expect variation in color due to photo and monitor settings as well as natural product variance. Ask any questions regarding colors, materials, options, measurements, installation, requirements, special requests, etc. prior to purchase. Note that we do not recommend installation using power tools as these can put too much force on the product and cause damage, this is especially true for mirror style guards. Take your time for installation; do not use power tools and do not over-tighten screws or other components. If you elect to drill or cut your own controls or holes, please be aware that some guards are extremely difficult to drill yourself if you do not have experience or proper tools. Mirror guards are especially suspect to damage.